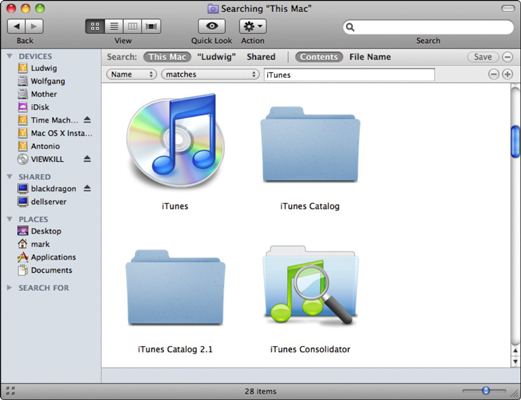 With the Finder active, display the Find controls by pressing Command+F. Mac OS X displays the controls that you see here. The Find controls add a bit of extra power to a search. Click the buttons at the top of the list to specify where you want to search. You can choose Computer (your entire system, including network volumes), a local volume, or your Home folder. To search for a specific filename, click the first pop-up menu in a row and choose Name; then type all or part of the filename in the Contains box. Snow Leopard automatically begins searching as soon as you type at least one character. After you locate the file or folder that you need, click the entry name to reveal the location of the matching file or folder. You can also double-click it to launch (or display) it. If you want to search for a text string within the document itself, click the first pop-up menu, choose Contents, and then type the string to match in the box. The text must appear just as you’ve typed it, so it’s always a good idea to restrict what you’re searching for to a minimum of words that you’re fairly sure will cause a match. (Content searching is not case sensitive, though.) Content searching works only when you’ve generated an index, which is explained elsewhere on this site. To include additional search criteria lines, click the button with the plus sign next to the last criterion line. You can limit your results based on all sorts of rules, including the date that the file or folder was last modified, when it was created, the file type, the size, the extension, or whether the file or folder is marked visible or hidden (such as a system file). You can also remove a search criterion line by clicking the button with the minus sign. To save the search criteria that you selected, click Save. This creates a Smart Folder, which Snow Leopard automatically updates (in real time) to contain whatever items match the criteria you’ve saved! You can specify the location for your Smart Folder, and you can choose to add it to your Finder sidebar for ultimate convenience. When you’re done canvassing your computer, click the Back button in the Find dialog to return to the Finder.